If you have been searching for the perfect nickname for your guy best friend, your search stops here. In this article, I’m going to teach you how to come up with good nicknames for your male best friends. There are several benefits of having a friend so awesome that you can call him your best friend. Recent studies have found that people with more friends are likely to live longer, have better mental health and are less likely to have dementia. No doubt friends are important to our lives. How else are we going to make sense of the world without a loyal partner in crime? So if you’re lucky enough to have a good friend and you even regard this person as your best friend, surely, you will need a nickname for him. In this article, we have compiled a list of nicknames for male best friends. So, if you need a fun pet name for your bro, we’ve got you covered. The following are good nicknames for your Guy Best Friends if you don’t find a nickname that fits your bro, check out this article on how to come up with unique names for him. 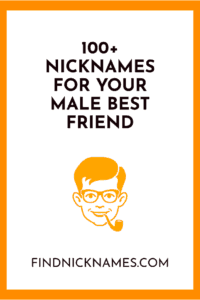 So, what fun names do you call your male best friend? Beebo~ Because that’s the fan name for Brendon Urie and my dear best friend reminds me of him. Headache- If he gets on your nerves.